St. Martin's Griffin, 9780312384852, 336pp. For years, the New England Patriots were a certifiable joke of a franchise. They were run on the cheap and were once the very example of how not to manage a team. They hired inept coaches---one of whom (Clive Rush) was nearly electrocuted when he grabbed a microphone at his introductory press conference. In 1968 their scouting director, Ed McKeever, suggested they draft a wide receiver . . . before someone in the organization realized the player had been dead for six months. They plucked ex-players out of the stands minutes before kickoff---Bob Gladieux was enjoying a beer at the game when he heard his name called over the P.A. (The Patriots had cut a player earlier that morning and found themselves short. Gladieux, who would go on to spend four years in the league as a running back, made the tackle on the opening kickoff.) And they played in a run-down stadium that was one of the worst venues in professional sports. There were brief moments of success, but on each occasion, front-office infighting would invariably cause the franchise to slide back down to the basement again. But in the first four months of 2000, everything changed. The hiring of head coach Bill Belichick and Vice President of Player Personnel Scott Pioli and the drafting of quarterback Tom Brady turned the fortunes of the franchise around. And their nontraditional approach to acquiring personnel---remembering that it's not about collecting talent, it's about assembling a team---quickly led to three Super Bowl titles in four seasons. It's a feat that, in the salary cap era, with free agency, planned parity and balanced scheduling, is in many ways even more impressive than anything achieved by the past dynasties of Green Bay, Pittsburgh, Dallas, and San Francisco. Along the way, Christopher Price has had a front-row seat for football history, chronicling the rise to power of the NFL's unlikeliest superpower. Price takes the reader inside the franchise to give him a dynamic portrait of a mighty organization at the height of its power. Readers are immersed in the locker room during the strange and tumultuous days of 2001 and 2003, when major personnel moves involving a pair of the most popular players in franchise history---Drew Bledsoe and Lawyer Milloy---threatened to rock their championship foundation to the core. Readers get an up-close look at the team that dominated the league on the way to a record-setting winning streak in 2004. And Price analyzes what went wrong when they fell short in 2005 and 2006, and how they plan to return to Super Bowl form in 2007. The Blueprint will explore how the Patriots went from the dregs to a dynasty, becoming the gold standard for professional sports franchises everywhere. 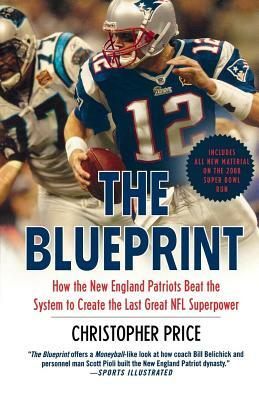 It will prompt sports fans (and those who study organizations) to acknowledge what many football insiders have believed for a long time: when it comes to building a successful system, the Patriots have the Blueprint. Christopher Price is a native New Englander who has covered the Boston sports scene for the last 20-plus years, bringing insightful game stories and in-depth features to a variety of local and national media outlets. An award-winning sportswriter who has been honored by Northeastern University, New England Press Association, and the North Carolina Press Association for his work, he’s served as a contributor to ESPN.com, SI.com, WEEI.com, and Baseball America, as well as The Boston Globe, The Washington Post, The Miami Herald and The Cape Cod Times. In addition, he’s the author of “New England Patriots: The Complete Illustrated History,” as well as “Baseball by the Beach” and “The Blueprint: How the New England Patriots Beat the System to Create the Last Great NFL Superpower.” He lives outside of Boston with his wife Kate, his son Noah and their cat, Stretch.